Synopsis: Yoshioka Futaba, a normal high school girls has the habits of disliking guys. However, among these guys there is one person whom she treats differently, Tanaka. At some point, their relationship progress but Futaba was shocked with the news Tanaka transferring school without any notice soon after summer holidays. Will they ever meet again? Thanks for the release, can't wait to read!!!! just saw the art, and wanted to read, thankyou very much! Thank you so much! This is a really amazing manga and I'm so happy a scanlating team has caught on to it! thanks for giving us a new chapter.. cheers! Thank you very much fo the release. I love this mangaka artwork ! Thank you for all the hard work and releases! Thanks so much. Love this series!! I liked Strobe Edge so I thought I'd check this out. I simply love this mangaka and this one promises a great story just like the other. :3 thank you for the releases! Thank you for the release! 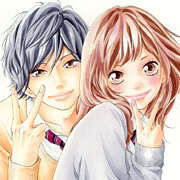 I really like this manga.. Thank you for releasing a great chapter as always! !